After 7 years of knitting, I suppose it was bound to happen. Moths. The scourge of all knitters found my bag of hand-knitted socks and decided that my hand-dyed Smaug socks were the tastiest treat this year. I discovered the damage on one of the first cold days this autumn when I delved into the bag and pulled out these bright red socks that I only wore once before. They were a pleasure to knit and I love them. The first sock was fine, but when I put on the second, I spotted a number of holes along the foot and leg. Nooooo! Parts of the sock were unravelling and I knew there was only one thing left to do: I'd have to start over. Luckily, it is only one sock that sustained any damage so I've ripped it back completely and started over. Since I dyed the yarn myself, I really hope I have enough of it to finish the socks. In some places the yarn is very thin and I also have a few short lengths I need to incorporate somehow towards the end, should I need them. In fact, I am thinking now that I should probably knit the socks all over again in a different yarn because this is just too fiddly. It would be a shame, though, as I dyed the yarn particularly for this project and won't get the exact shade of red again. We'll see. I'll keep going for now, but if I do run out of yarn, there's nothing for it. I will have to start from scratch. Although I usually don't knit the same socks twice, these Smaug socks are fantastic and as a fan of Tolkien's work I simply need to have them. If all else fails, the 13-disc Lord of the Rings audio recording from the BBC should get me through this. Did moths ever get a hold of one of your finished pieces? What did you do? Oh no that is horrible! Those poor pretty socks. I really hope you'll have enough yarn to safe this sock. Luckily I've never had a moth visit my handknits (*knocks on wood) but I guess it's inevitable at one point, so when they do I hope the damage will be limited. I hope moths stay away from your knits! I have pretty much made up my mind now that. 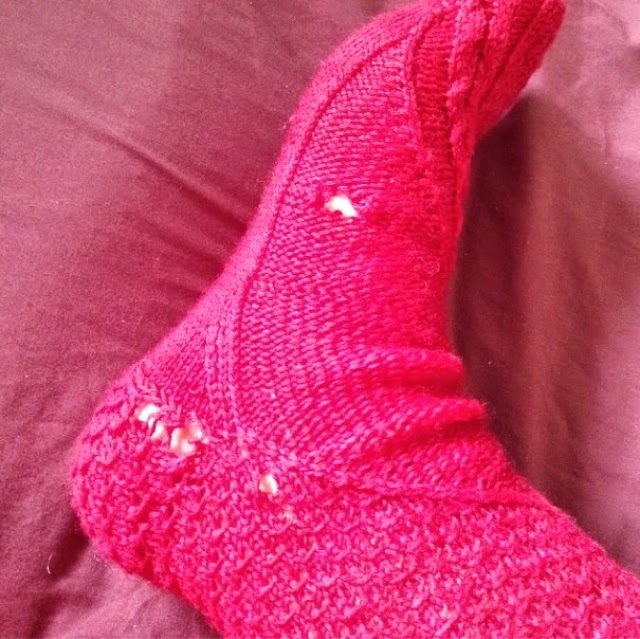 I will reknit both socks in another yarn. The unravelled sock yarn is not in a good state in places and makes it hard to use. For now I have put the socks away while I work on a new project instead. I think I need to recover from this shock first!